The 12v / 24v 120A Cyrix CT battery combiner from Victron Energy is a feature-packed intelligent split charge solution for charging your leisure battery from your alternator and ensuring you never accidentally flatten your starter battery. 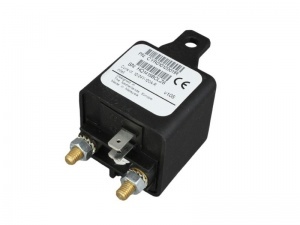 More commonly known as a voltage sensitive (or sensing) split charge relay, this unit will automatically connect your starter and leisure batteries when a charging voltage is sensed and will automatically disconnect them when it senses the voltage drop away when the engine is turned off. This isolates the batteries when they are not charging so your starter battery cannot be drained by your domestic circuits. 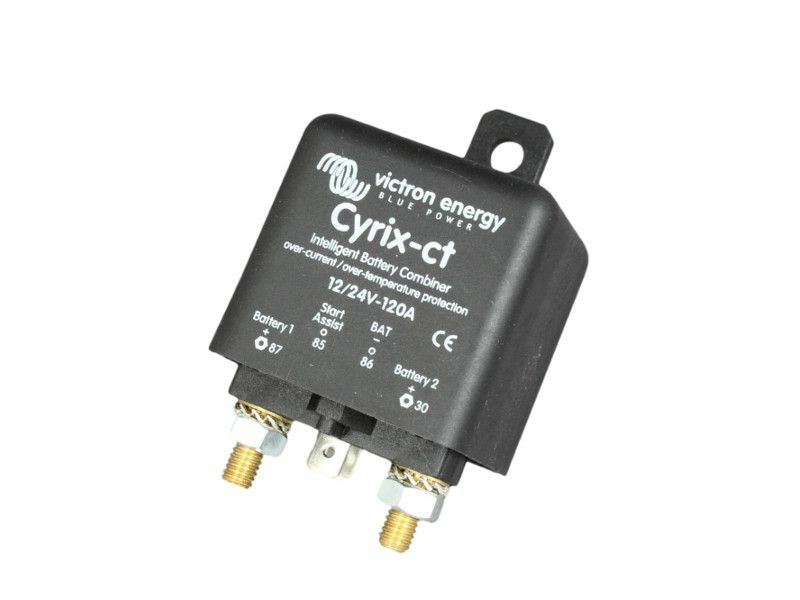 This relay features voltage trending software to overcome short-term fluctuations in voltage levels and prevent unwanted disconnection (e.g. when first connected to a leisure battery with very low charge and/or of a very high capacity, the resultant voltage drop across the starter battery can be significant and can trigger a false disconnect in some other voltage sensing relays - sometimes referred to as 'chatter' as the relay quickly opens and closes repeatedly). Another useful function is the emergency start assist. 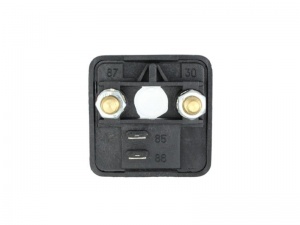 If the starter battery has become flattened and you wish to use the leisure battery to start the vehicle, you can manually close the relay using a momentary switch wired to terminal 85 (relay remains closed for 30 seconds). 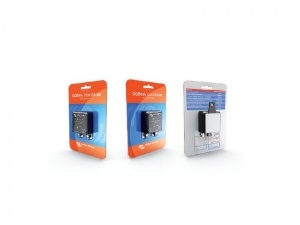 PLEASE NOTE: These relays are not suitable for vehicles with 'smart' or 'intelligent' alternators. As a guide this applies to vehicles having engines that comply with Euro5 emissions standards and onward, often also incorporating regenerative braking (if in doubt please consult your vehicle manufacturer to confirm). If your vehicle has a smart alternator then you will need to use a battery-to-battery charger instead of a VSR. Standby current draw: 4mA max. Delivered quickly & does what itsays! Very pleased with this compact relay, easy to mount and connect up. Checked with some voltage logging (using a Raspberry Pi) and it certainly works. Batteries are connected within a few seconds of engine starting, as the alternator provides charge. Both batteries are also connected with the engine off when the leisure battery is on charge, as soon as the voltage rises enough. The ability to add a manual switch to allow for "jump starting" from the leisure battery is a good idea, I hope I'll never need to use it. Such a great, simple and affordable solution to heavy duty split charging systems. No pick up from the alternator or other related control required. It just looks after it's self and with the added feature of voltage sensing in both directions, one couldn't want for more and yet there is more. The feature to connect both batteries on command is a lovely addition. Will use nothing else in the future. Superb website, best advice ever and superb simple installation. Just one wire from main battery positive - what could be simpler? I've recommended 12Volt Planet to friends & family.